Its somewhat of an acheivement for me. From yarn purchase to completion only took 7 days! Almost all yarn I but sits in my stash for ages so I am pleased with this! Its also an acheivement as I hate working with black yarn, so to finish it was quite good. I appreciate that the photos dont really capture the texture. It is really hard to see the detail on black yarn but beleive me when I say it is lovely. 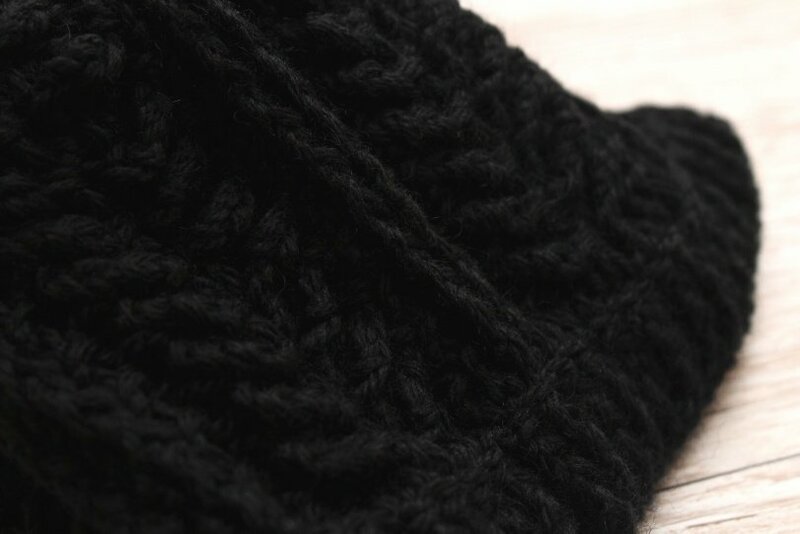 This is the Mackinack beanie by The Unravelled Mitten. You can find it here. There are only two things I would tell you if you want to have a go. The pattern says 200 to 225 yards. I used Novita 7 Brothers, which has 218 yards to a ball and I had loads left, so I dont think you need as muxh yarn as the pattern suggests. The other note I would make is that the starting chain is that the band is a little tight on mine – the actual stitches are fine but the foundation chain is too tight – so if I were to make it again I would go up a hook size to loosen the chain. Another set of facepads for you today, this time with a sunny feel. And for these ones, I have a pattern to share. This pattern is worked in a spiral. R10. 2Sc in 1st stitch. 1sc in next 8. Repeat 5 more times. (60) slip stitch to finish the round. R11. Chain 4. Sc into 2nd chain from hook, hdc into next and dc into next. Skip 1 stitch and slip stitch into next. Repeat until end. And there you have it. You very own crochet facepads. 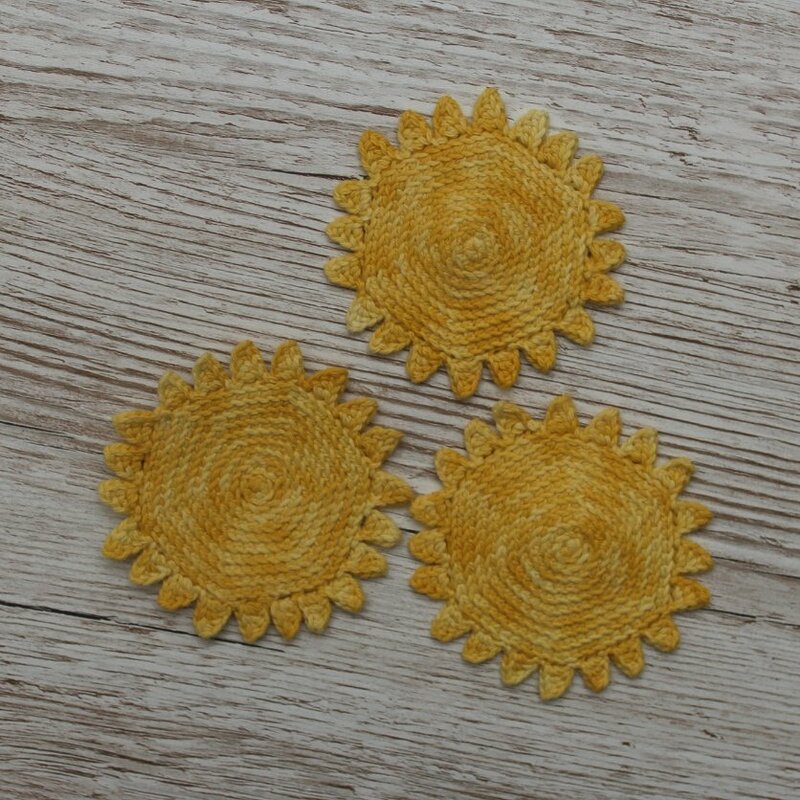 Perfect for gifting with some sunny soap or just for brightening up your own morning routine. 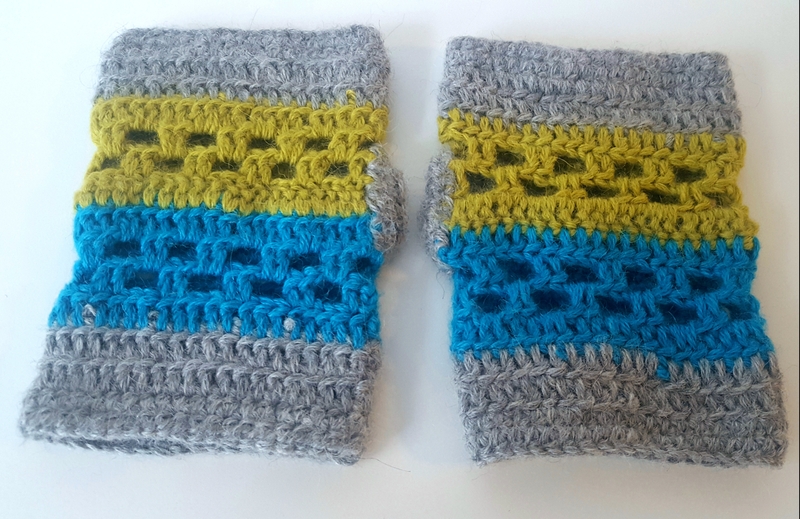 As promised here is the pattern for the matching mittens to the hat I published last week. For these mittens you should hold 2 strands together whilst working. For the whole set you need 2 balls of each colour. 2. Chain 2. Hdc into all stitches. 3. Chain 3. Dc in all stitches around. 4. Chain 3. Dc in all stitches around. Fasten off and change to green yarn. 5. Chain 3. Dc in all stitches around. 6. Chain 3. Dc in first stitch, *chain 2 (skip 2) and dc in the next 2*. Repeat until you reach the last ch 2, skip 2 then sc in the last stitch of the round. Ss into first dc. 7. For the next round ss across the dc to the first ch2 space, then chain 3 and dc onto the ch 2 space. *Chain 2 then sc 2 times onto the next ch 2 space*. Repeat to end, but instead of making the final chain 2 and slip stitching to close the round, instead you should stop at the last 2dc. Turn your work. 8. Chain 3, the dc until the first dc of the last row (you should have 38dc stitches). Fasten off and change to blue yarn. 9. Chain 3. Dc in all stitches to end, then chain 2 and ss into the first dc of the round. 10. Ss across two more dc’s, then chain 3 and dc into the next stitch. *Chain 2 (skip 2) then sc 2 times onto the next 2 stitches*. Repeat to end. Chain 2 more and ss into the first dc stitch. 11. For the next round ss across the dc to the first ch2 space, then chain 3 and dc onto the ch 2 space. *Chain 2 then sc 2 times onto the next ch 2 space*. Repeat to end. Chain 2 and ss into first dc. 12. Chain 3. Dc in all stitches around. Fasten off an change to grey yarn. 13. Chain 3. Dc in all stitches around. 14. Chain 3. Dc in all stitches around. 15. Chain 3. Sc in all stitches around. 16. Chain 3. Sc in all stitches around. Finally, for the thumb holes, gind the hole in the side of the mitten from row 7 to 11. Attatch yarn and Sc twice into each dc post around for 20 Sc. Ss into the first. Cjain 1 and then complete another row of 20 Sc. Fasten off and weave in all ends. Then you are done! These mittens are super warm. I wore the set for bonfire night this year and they were lovely and snuggly! You can find the plttern for the matching hat here. Finally, I am getting around to publishing this pattern. 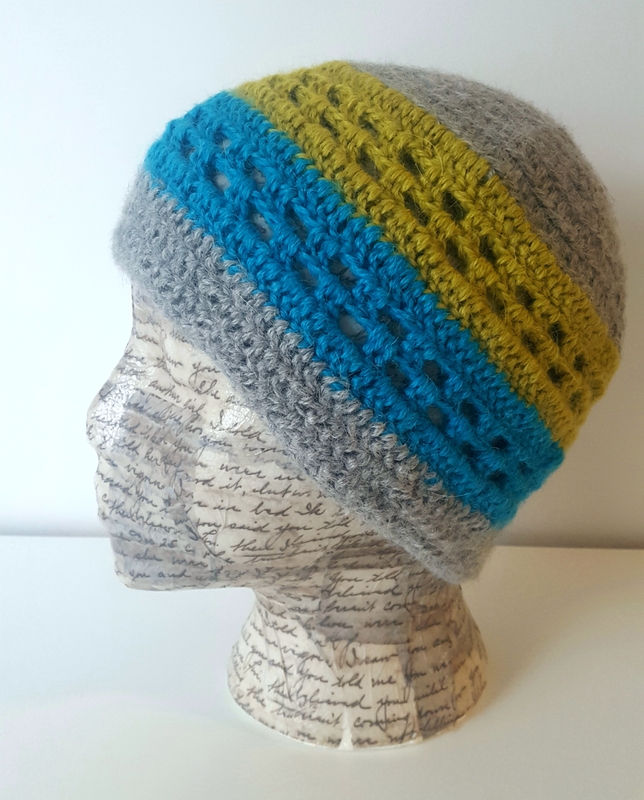 I made this hat using Drops Alpaca – The colour choice was dictated by what was lying around in my stash. 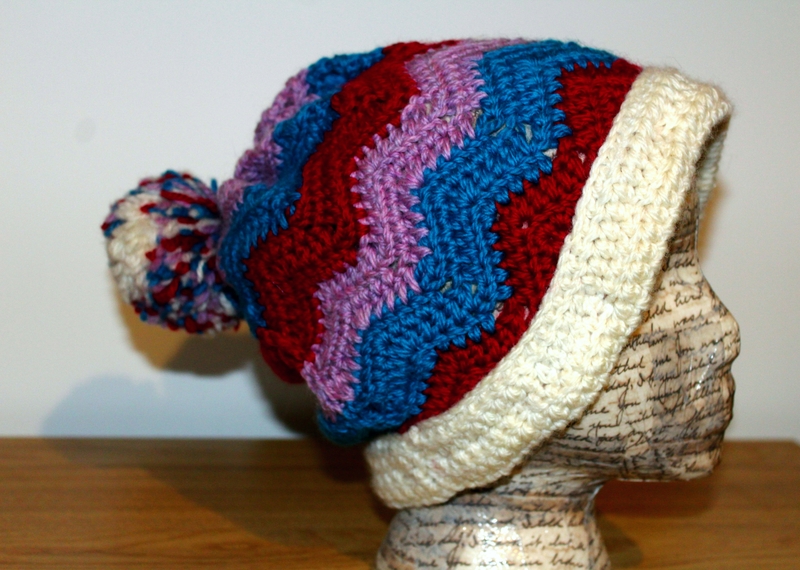 You may remember that last christmas I made a hat for my brother in law to be for. If not you can find it here. I used the yarn leftover from that project to create this. For this hat you should hold 2 strands together whilst working. For the whole set you need 2 balls of each colour. 9. In the next round, dc twice into the first stitch then once into the next 7. Repeat. (108) Fasten off. 10. Dc in all stitches around. 11. Dc in first stitch, *chain 2 (skip 2) and dc in the next 2*. Repeat until you reach the last ch 2, skip 2 then sc in the last stitxh of the round. Ss into first dc. 12. For the next round ss across the dc to the first ch2 space, then chain 3 and dc onto the ch 2 space. *Chain 2 then sc 2 times onto the next ch 2 space*. Repeat to end, ch 2 one last time and ss into first stitch of the round. 13. Dc in all stitches around and twice into each chain 2 space. (108) Fasten off. 14. Dc in all stitches around. 15. Dc in first stitch, *chain 2 (skip 2) and dc in the next 2*. Repeat until you reach the last ch 2, skip 2 then sc in the last stitch of the round. Ss into first dc. 16. For the next round ss across the dc to the first ch2 space, then chain 3 and dc onto the ch 2 space. *Chain 2 then sc 2 times onto the next ch 2 space*. Repeat to end, ch 2 one last time and ss into first stitch of the round. 17. Dc in all stitches around and twice into each chain 2 space. (108) Fasten off. Keep your eyes peeled for matching mittens! Once again, For this hat you should hold 2 strands together whilst working. For the whole set you need 2 balls of each colour. So recently I shared with you a simple chevron infinity scarf pattern. 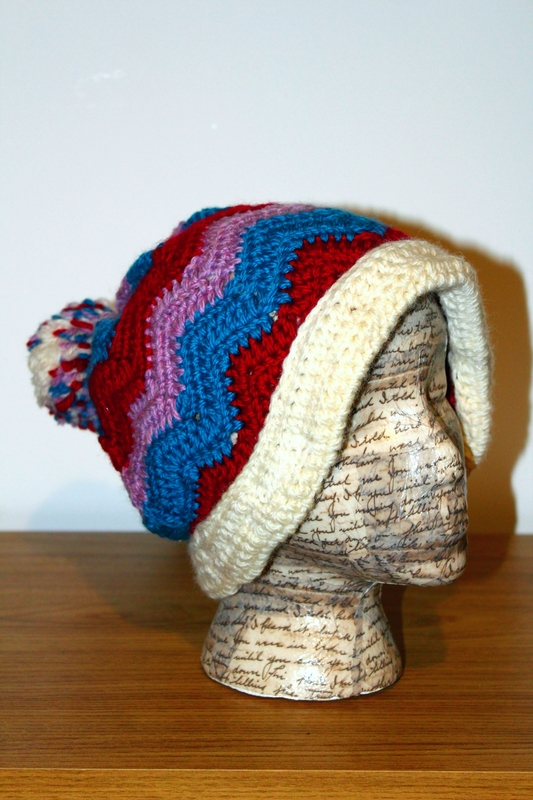 On the night when I finished this I still had plenty of yarn left over and so I decided to make a matching hat. To go with it. Here is the pattern. 2. Hdc into the next ch from the hook, Skip 1 *Hdc into the next 4 chains. 3Hdc into the next chain, Hdc into next 4ch. Skip 1* repeat until you have just 2 chains remaining. Skip 1 and Hdc into the last chain. Ch1. Turn. 3. Hdc into the first stitch. Skip 1. *Hdc into the next 4 stitches. 3Hdc into the next stitch, Hdc into next 4 stitches. Skip 2* repeat until you habe just 2 stitches remaining. Skip 1 and Hdc into the last chain. Ch1. Turn. Repeat row 3 x 16 times. 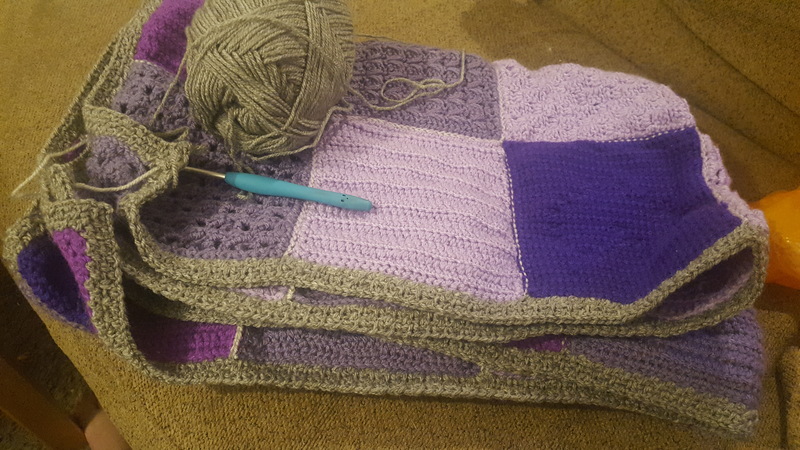 You will now have a rectangle of wavy stitch. Put this to the side. We will now work on the brim of the hat. 2. Hdc into the next chain from the hook then in all chains to the end. Repeat this 4 times so you have 4 rows of Hdc. At the end of the 4th row, ch3 and turn. 3. Dc into the next stitch and all stitches to end. Repeat this step 3 times. Fasten off leaving a long tail on the end for assembly purposes. Fold the rectangular brim in half and pin it in place along the bottom edge of the wavy rectangle. Take the long end of the brim tail and sew along the top edge to fasten both sides of the fold togrther with the bottom edge of the wavy rectangle securely sandwiched inbetween. Once this is done, sew up the back of the hat. You ahould now habe a tube. 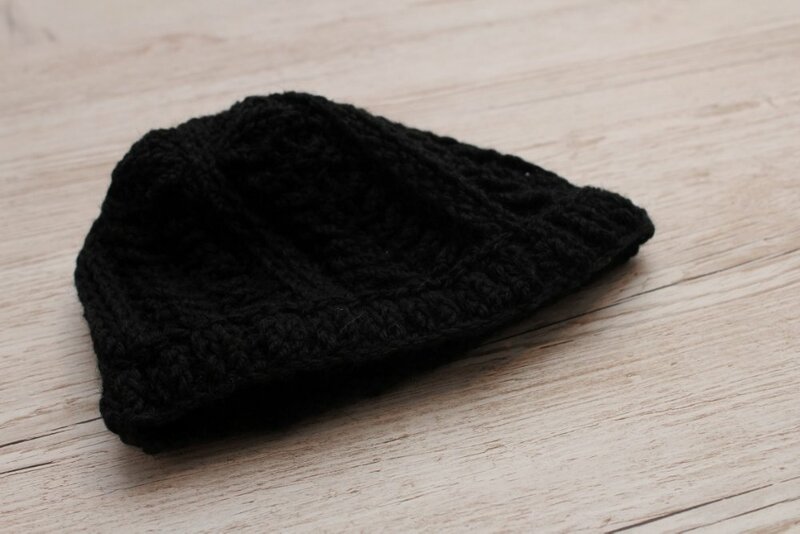 To seal off the top of the hat, take a length of matching thread and sew it into the top 3 stitches of each peak in the wavy pattern. Then pull tightly so that all of the peeks meet and tie off to secure. 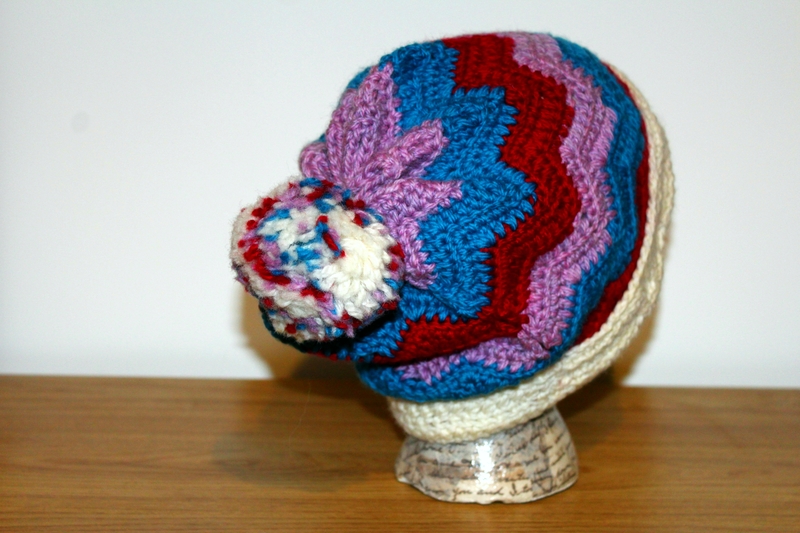 Finally, make a large pom pom out of the remaining yarn and secure to the hat using the taild of the thread used to tie the center of the pom pom.